Two former students opened fire at a Suzano, Brazil school on Wednesday, March 13, 2019, and killed at least six teenagers as well as two school officials before dying by suicide in an attack that police said was inspired by the 1999 Columbine massacre in the United States. The two armed men were wearing face masks or hoods. They shot and killed the six children who were on their snack break, as well as two school officials, before fatally turning their guns on themselves. They reportedly were carrying firearms, crossbows, and homemade bombs. The gunmen have been identified as Guilherme Taucci Monteiro, 17 years old, and Luiz Henrique de Castro, 25 years old. 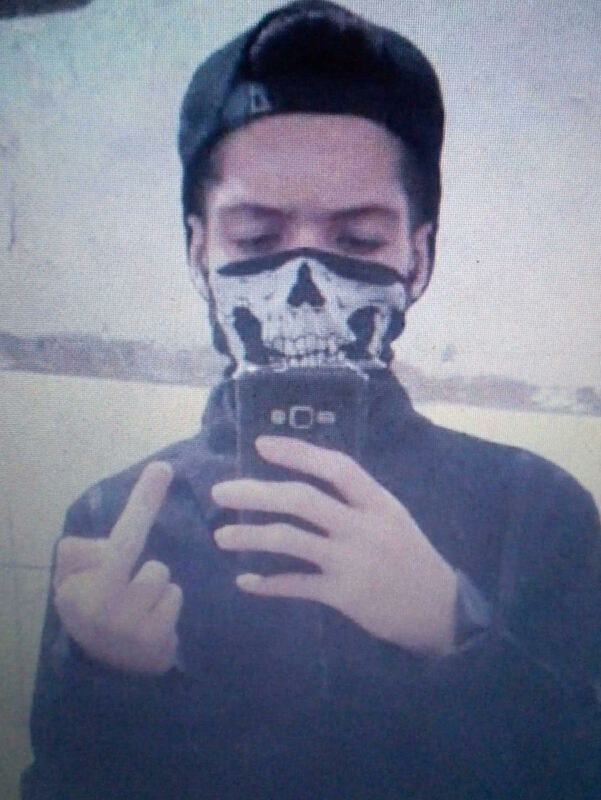 Monteiro (pictured) posted images of himself on Facebook shortly before the attack. Before entering the Raul Brasil School in Suzano near Sao Paulo, the former pupils shot and killed the younger assailant's uncle, who owned a car rental agency where they stole a vehicle. 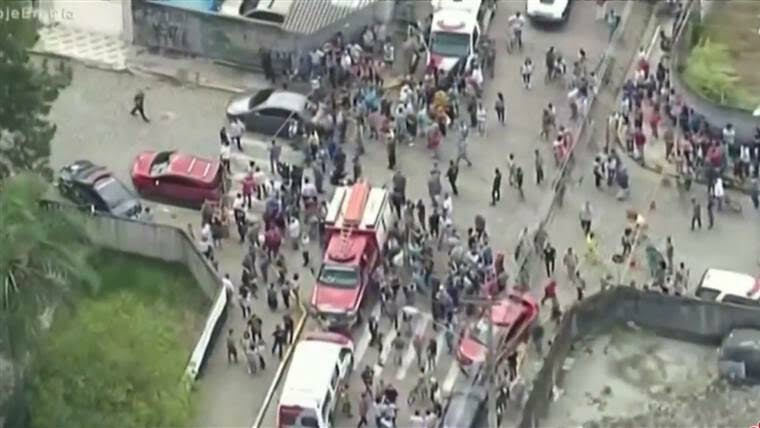 Ten people, including the two attackers, were therefore killed in total, Sao Paulo police said. The students who were killed were boys mostly 15 and 16 years old. A Columbine copycat? A few media accounts in Brazil are discussing this school shooting as a copycat of the 1999 Columbine attack, which involved two young men with multiple fatalities. But this date is filled with anniversaries. March 13, 1943, is the date on which the Nazis liquidated the Jewish ghetto in Kraków, Poland. This Brazilian shooting occurred on the anniversary of the Dunblane shooting in Scotland where 16 youth and a teacher were killed, ending in the suicide of the gunman. On March 13, 1996, Thomas Watt* Hamilton, a local Stirlingshire man, shot dead 16 children and their teacher, Gwen Mayor, in Dunblane Primary School's gymnasium before killing himself. He used his licensed weapons and ammunition. This is not the first mass school shooting in Brazil. 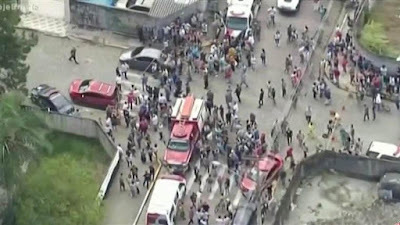 On the morning of April 7, 2011, twelve children aged between 12 and 14 were killed and 12 others seriously wounded by an armed man who entered Tasso da Silveira Municipal School (Escola Municipal Tasso da Silveira), an elementary school in Realengo on the western fringe of Rio de Janeiro, Brazil. In 2015, there was a fatal school incident in Spain. A 13-year-old Spanish boy armed with a crossbow and a machete killed a substitute teacher and injured four people at his school, the Joan Fuster School in the La Sagrera neighborhood of Barcelona, Spain. Since it occurred on April 20, 2015, a direct Columbine date copycat. See my analysis here. While the Columbine High School shootings on April 20, 1999, became the modern template for school shootings, as noted in great detail in my 2004 book, The Copycat Effect, the "modern era" of school shootings began in the USA on February 2, 1996, in Moses Lake, Washington. The new pattern that was shown in that shooting was of a male student (not an outsider) entering the school and killing his classmates and teachers. In the Moses Lake event, Barry Loukaitis, 14, in this Columbine precusor, dressed all in black, including a long coat (apparently more of a Western duster than a trenchcoat), held his algebra class hostage, killed two students, wounded another severely, and killed his algebra teacher, Leona Caires. Loukaitis then turned to the class and said "This sure beats algebra, doesn't it?" The quotation was nearly a direct one taken from a Stephen King book, Rage, about a school shooting of an algebra teacher that Loukaitis allegedly used as the model for his attack. 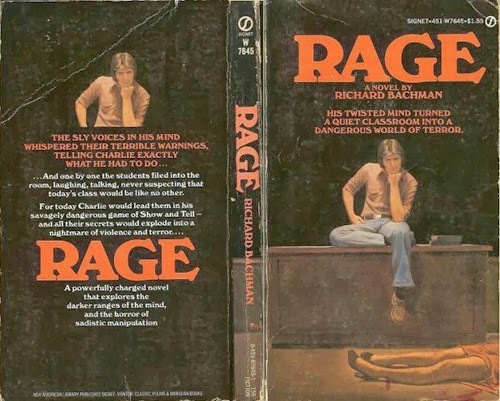 The first novel by Stephen King published under the pseudonym Richard Bachman in 1977. King withdrew the book from publication three years later, after Columbine. What subject did the Brazilian adults who were killed teach? The Brazilian shooters were students of mass violence. Loukaitis had planned the shootings carefully, getting ideas, he said, from the Stephen King book Rage (1977). In it, a troubled high school boy takes a gun to fictional Placerville High School, kills his algebra teacher “Mrs. Underwood,” another school adult “Mr. Vance,” and takes the algebra classhostage. Police would find a collection of Stephen King's books in Loukaitis' bedroom, including his well-worn copy of Rage. The Rage scenario had been played out before in real life. At Valley High School, Las Vegas, Nevada, on March 19, 1982, after algebra teacher Clarence Piggot refused to cancel a public speaking assignment; 17-year-old Patrick Lizotte gunned him down. Patrick also wounded two other 17-year-old students during his rampage. He left the school and was killed nearby during a shootout with the police. On January 18, 1993, Scott Pennington, 17, took his senior English class captive at East Carter High School, in Grayson, Kentucky. He killed his teacher and a custodian. Pennington would tell investigators later that he only read Rage after the shooting. In 1997, Rage would be linked to another shooting. A copy of Rage was found in the locker of Michael Carneal, a high school shooter in West Paducah, Kentucky.